iCloud Photo Library is a popular Apple cloud storage service which allows you to easily access, edit and even delete your personal videos and photos right from all your Mac, iPhone, iPod touch and iPad devices. You can also view, edit and download these videos and images either from the official iCloud website (www.iCloud.com) or directly from your Windows PC. To access your favorite photos and videos from the iCloud Photo Library service, you need to be logged in to the service using your official Apple ID. Provided below are different ways to access to iCloud Photos. You can easily access your favorite iCloud videos and photos on your iPod touch, iPad and iPhone using a few steps provided below. The iCloud Photo Library service can only be accessed on Apple handheld devices running on the iOS 8+ operating systems. Apple device users whose gadgets have an older operating system (iOS 8 and below) are required to first install the latest iOS version on their device. To do this, simply go to your gadget's main "Settings" and then tap on the "General" feature provided. After that, simply click on "Software Update" once prompted. Once you have the latest operating system installed on your iOS device, you can then proceed to log in to your iCloud account which can be accessed from your Apple handheld device's main settings. You can then enter your default Apple ID for identification. Once you have successfully logged into your iCloud Photo Library account, you can then either choose to activate the "Shared Photo Streams" feature to view your shared pictures and videos or the "Photo Stream" feature to view your personal images and videos. To do this, simply launch your gadget's default imaging app and then tap on the "Photo Stream" button that is provided at the end of the screen. If by any chance you don't see this button, just click on either the "Albums" or "Camera Roll" features to reveal it. Congratulations, now you can easily view your favorite photos or those that your friends have shared with you. You are required to first have the latest OS X version installed on your Mac to access your favorite iCloud videos and photos. You can easily update your Mac's operating system simply by going to the "App Store" and selecting the "Updates" option. This will automatically install the required updates. Now you can proceed to access your videos and photos using the steps below. Step 1: Open the "System's Preferences" window located on your Mac's default "Apple Menu". Once there, simply tap on the "iCloud" feature which will then redirect you to a new window where you will be prompted to log into your "iCloud" account by entering your official Apple ID and secret password. Step 2: Once you have successfully logged into your account, you can then proceed to activate the "Photo Stream" feature which you will require to access your iCloud videos and photos. Tap on the "Options" feature, which you can then use to enable both "Shared Photo Streams" and "Photo Streams" functions. Step 3: By clicking on either the "Aperture" or "iPhoto" feature provided at the topmost part of your PC's screen you will be redirected to the "Preferences" section where you will be able to view your video and photo files. 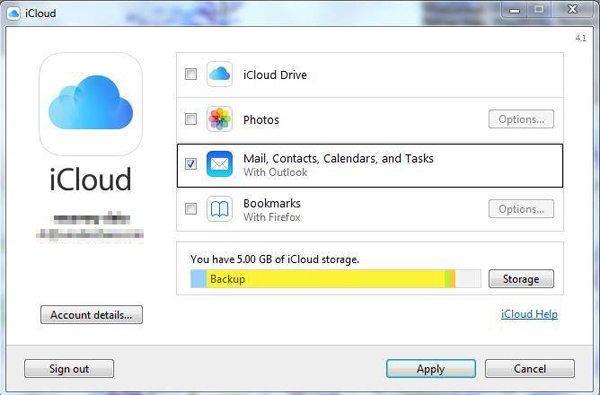 It is now possible to access your iCloud Photos on the Windows 7, 8 and 10 systems. Below are the two main steps of accomplishing this. Way 1. Using "iCloud for Windows"
1st - First of all, visit the official iCloud website (www.iCloud.com) and download the iCloud for Windows installation file depending on your PC's operating system. Once downloaded, locate the installation file, double-click on it and follow the instructions provided as you wait for the program to install successfully. 2nd - After the program as successfully installed, launch it through double clicking on its icon or locating it manually through the Windows Search toolbar. You can then proceed to login to your iCloud account using the Apple ID and Secret password you have been using on your Apple devices. 3rd - Once logged in, you will be then provided with various features that you can use but for this case simply select the "Photos" category. This will make it possible for the iCloud Photo Library service to create a special folder with your synced images on your Windows PC. 4th - After your images and videos have successfully downloaded into your PC you can then proceed to locate the "iCloud Photos" folder that can be found in your Windows PC's "Favorite" section. Congratulations now you can easily view, edit and even delete your iCloud photos. Way 2. Using "iCloud Control Panel for Windows"
Step 1. Visit iCloud.com to locate and download the iCloud Control Panel for Windows installation file. Once the downloading process has completed double-click on the installation file and follows any other instructions provided. After that, you will be prompted to enter your official Apple ID and secret password that you have been using on your other Apple devices once you launch the installed program. Step 2. Once you have logged into your iCloud Photo Library account, you can then tap on the "Photo Stream" button to activate the highly beneficial feature. You can also select the "Shared Photo Streams" option if you wish to view and download videos and images that your friends have shared with you. Click "Apply" once prompted. For Windows 8 users, simply open the "Photo Stream" feature to view, edit or even delete your images. Bonus: How to Manage iOS Photos on PC/Mac OS Effectively? If you think it is troublesome to view iCloud photos on iDevice, Windows or Mac computer, we could like to high recommend you to use this MobiKin Assistant for iOS as the best iPhone/iPad/iPod Photo Manager. With it, you can easily view iDevice photos on the Windows or Mac computer, and backup them on the desktop computer as you like.